a most fitting inscription for this book, which was published in 1993. Winner of the 1994 Newbery Medal, The Giver has been called controversial due to some of the mature themes, and has been banned at various times. 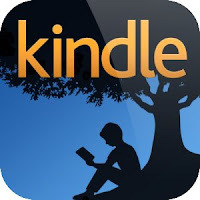 Despite or more likely partially due to this, The Giver is one of the most popular books read by young adults today. It's also read in some college-level classes, because it leads easily into discussions about rules, conformity, freedom of choice, and other significant topics. "If everything's the same, then there aren't any choices! I want to wake up in the morning and decide things! A blue tunic, or a red one?" 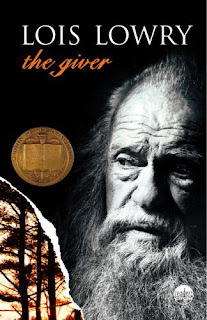 Set in the future, The Giver is the story of a young boy named Jonas living in a highly structured, controlled community, a society which has eliminated pain and strife by converting to "Sameness". Residents live peacefully in "family units", and there are many rules and ages for nearly everything. For example, when a child becomes "a Nine", he or she is officially allowed to ride a bicycle. In this novel, there's much attention given to the importance of the "precision of language", which is taken to such an extreme that corporeal punishment is used from an early age to ensure it. 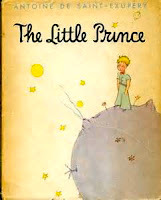 Upon the first "stirrings", children begin to take special pills that they'll continue to take throughout life to control their emotions, stay detached, and carry out prescribed functions. Each member of this society is assigned a life role as "a Twelve", giving each a job in a safe, predictable environment for all. Furthermore, those who fail to conform properly are "released", in order to preserve the integrity of the community as a whole. What at first appears to a be a utopia soon reveals its limitations as a society in which much has been relinquished. 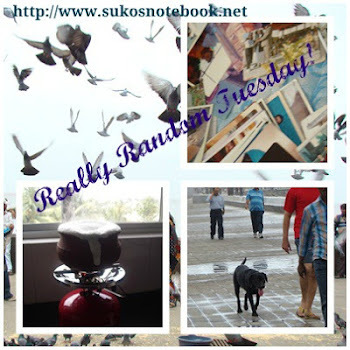 Gone are feelings, memories, colors, choices--even books! 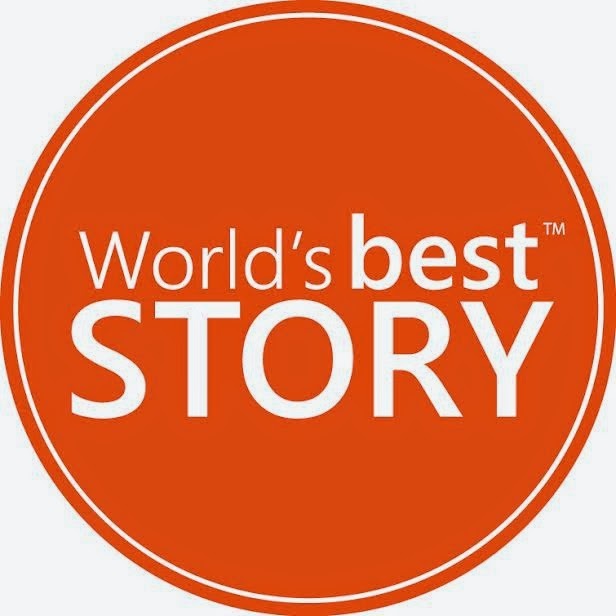 As the protagonist, Jonas, explores memories of a past he has never before known, he realizes that he's been existing in a bland, colorless, dystopia, devoid of true emotional depth. This book makes you think. I'll recommend it to my children as well as my readers, and reread it myself. It dramatizes the importance of questioning the status quo, and the cost and value of individuality and freedom of thought and choice. If you have read this book, or intend to in the future, I hope you'll take a moment to share your own thoughts. Reading Tea Time for the Traditionally Built was like slipping into a pair of comfortable shoes, soft and worn in all the right places. Once again, I found myself quickly immersed in the world of red tea, dramatic African scenery, and a familiar cast of characters, made even more familiar by the HBO series I've been watching on TV since it started on Sunday, March 29. The series is quite charming and makes me appreciate the books even more. "She finished her tea and began to walk back into the house. There is plenty of work for love to do. Yes. There was breakfast to be made, and letters to be answered, and the problems in clients' lives to be sorted out. There was quite enough to do without worrying about the sun consuming the earth. Yes, one should not worry too much, and then she looked at her van and thought: How long will I keep you going? One more day? One more week? And then how are we going to say goodbye, after so many years? It would be like losing a best friend, a faithful companion--it would be every bit as hard as that." 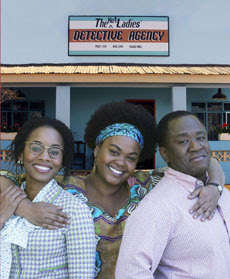 In the newest book, "traditionally built" Mma Ramotswe is troubled by the fact that her beloved, tiny white van is on it's last legs, while Mma Makutsi, her assistant, is troubled by a glamorous rival from her days at the secretarial college, Violet Sepohotho, who seems to be trying to lure away her fiancé, Rra Phuti Radiphuti. The detectives also have their hands full with a seemingly impossible case to figure out for Mr. Molofololo: why can't the Kalahari Swoopers win any more football matches, and who is to blame for this? There's also the case of the woman with multiple husbands--what is the best way to deal with her? 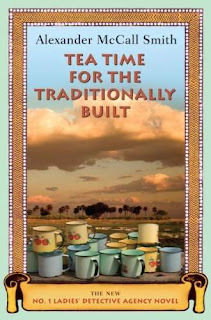 Tea is, of course, an integral part of this book by Alexander McCall Smith, and the traditional way of life in Botswana. I've been partaking in this tradition and drinking my fair share of red tea while watching the show (which I look forward to all week) and during reading. 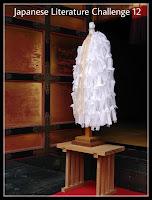 I finished reading Tea Time for the Traditionally Built in about two days, with a hint of sadness to be done. However, I'm happy to hear that there will be more books in this series, and on Sunday night, I'll watch the next episode of The No.1 Ladies' Detective Agency. Pomergranites? Pommogranits? Pomagranitz? Now is the perfect time to learn to spell the name of this exotic, slightly tart fruit. 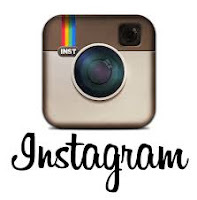 The correct spelling is above, in plain view: p-o-m-e-g-r-a-n-a-t-e-s (and there will be a spelling test next week). Pomegranates are one of the oldest fruits in existence, and some scholars suggest that it was the pomegranate, not the apple, depicted in the Garden of Eden. 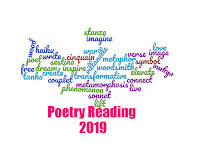 It's great appeal has made it the subject of epics and art, by artists and authors such as Shakespeare, Homer, and Cezanne. Pomegranates are also a superior source of antioxidants, and may help improve health in several ways. 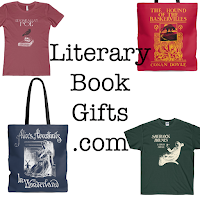 A quick Google search provided many books on pomegranates. I selected but a few to share. Pomegranate: The Most Medicinal Fruit, by Robert Newman, P.H.D., and Ephraim Lansky, M.D., published in 2007, provides readers with the history and science of this fruit as a health food, and includes artistic images and recipes. Pomegranate, by G.M. Levin, P.H.D., published in 2006, is a scientific and informative book, with a very lovely cover (this author has also written another pomegranate-themed book called Pomegranate Roads: A Soviet Botanist's Exile from Eden, published in 2006, which is a memoir of his life and search for rare, wild pomegranates). But you don't need to be a doctor to write about pomegranates. 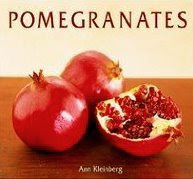 Ann Kleinberg, a food critic and columnist, wrote a beautiful cookbook, published in 2004, Pomegranates, which received many excellent reviews on Amazon. Her recipes are called "flawless" and "creative" by reviewers. Why all this talk about pomegranates? I never imagined I'd write a post about this fruit, even though it happens to be one of my favorites (we even have a pomegranate tree which bears fruit). Although I am health conscious (hopefully not sickeningly so), this is a blog about books, not health matters. However, I received an email from Janny of POM Wonderful, who has been sending very generous "care packages" of delicious pomegranate juice to food and health bloggers. I'd commented on a very funny food blog post I'd read, and as a result Janny offered me a free shipment of the juice, which of course I accepted, being partial to all things pomegranate. A couple of days later, I received an email from Jeff confirming the shipment, and the next thing I knew, the package had arrived. 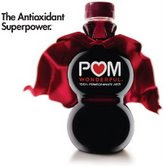 I've been enjoying POM Wonderful pomegranate juice over ice with a wedge of lime on the side of the glass. Whisk together ingredients and enjoy. Be sure to top your salad with freshly ground pepper. Thank you, Janny and Jeff of POM Wonderful. You are wonderful, and so is this refreshing juice! Mark Twain. O. Henry. Tennessee Williams. Arthur Miller. Simone de Beauvoir. Bob Dylan. Joni Mitchell. Janis Joplin. Leonard Cohen. Jane Fonda. Uma Thurman. Stanley Kubrick. Frida Kahlo. 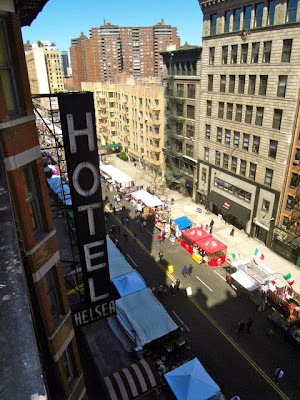 Countless writers, musicians, actors, directors, and artists have lived or stayed in NY's historic Hotel Chelsea. With such an artistic legacy, I felt privileged and honored to spend a week at this elegant, spacious, bohemian hotel ("boho") for spring break. Taken from the living room balcony outside of our suite (the "C" in Chelsea wasn't visible from this angle), this photo features the hotel sign and street fair below. 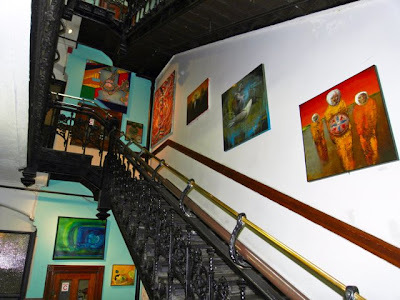 Colorful, contemporary art brightens the lobby and lines the stairways of the Chelsea Hotel. Taking the stairs was like walking through art galleries. I found this picture along the stairway. 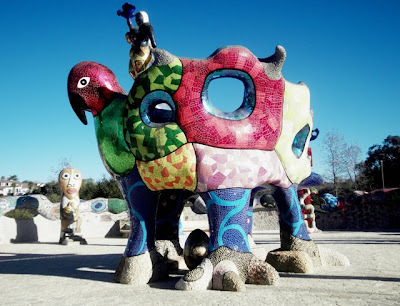 It's by one of my favorite contemporary artists, Niki de Saint-Phalle, who's known internationally for her large mosaic sculptures (pictured below is part of Southern California's Queen Califia's Magical Circle). 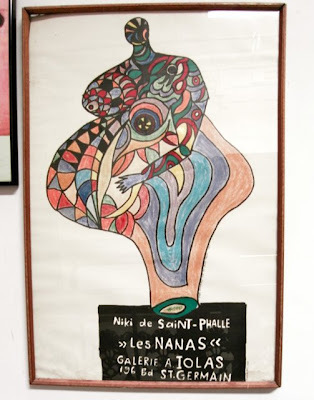 By now you may be thinking, isn't this a blog about books, not art? Don't worry, I'm getting to the books now. Truth be told, it was hard to settle down and read in NY. I saw my family and we were out a lot--we went to the theater to see three shows, West Side Story, Guys and Dolls (with Oliver Platt), and Accent on Youth (with David Hyde Pierce, and which features metaplaywriting). Most of my reading took place in flight, which is always the best way to make time fly by. I was able to finish two books on my To-Be-Read list. This Armenian memorial is in Emerson, NJ, and relates to one of the books I finished over spring break, The Road From Home: A True Story of Courage, Survival, and Hope by David Kherdian, the true story of a young girl's escape from the Armenian genocide. 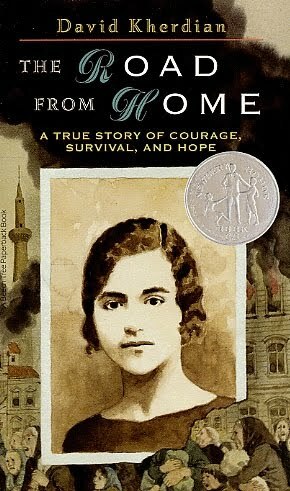 Published in 1979, this book about a young Armenian girl, Vernon Dumehjian Kherdian, has won several awards including a Newbery Honor Award. 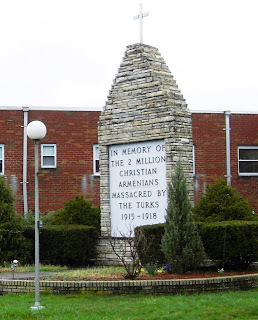 It's an important book because it preserves memories and records history, and will help future generations remember the extermination of the Armenians. I found that once I started reading this book, I couldn't stop. David Kherdian tells his mother's story as Vernon's life goes from idyllic to horrifying very quickly because of this devastating holocaust, but her will to survive is strong. 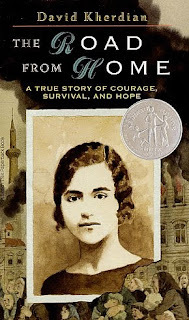 I recommend this young adult book to older readers, too, who have an interest in historical stories which depict extraordinary strength, spirit, and courage. "My size makes me speak slowly and move slowly, and it's also paradoxically enabled me to slip through cracks no one in Aberdeen would think possible." 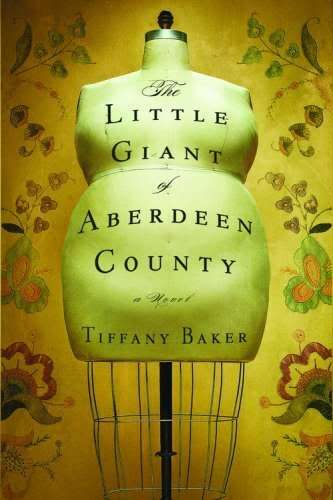 Another book I read and enjoyed, mostly at very high altitudes, was The Little Giant of Aberdeen County, published in 2009, the first novel by Tiffany Baker. I'd seen this book in the NY Times Book Review a few months ago and vowed to read it, because one of my favorite books is Stones from the River by Ursula Hegi, which happens to be about the life of a German dwarf (a zwerg), Trudi Montag, who helps Jews escape the holocaust. I thought that I might also enjoy a book about a giant (or giantess). Perhaps this is a tenuous connection, but the book proved to be a good choice. 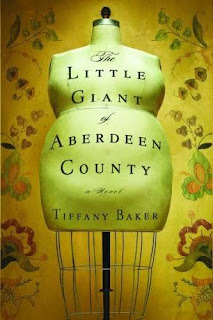 The Little Giant of Aberdeen County is a beautiful, memorable debut by Tiffany Baker, the story of a very large young girl who must learn to live with her unexpected, monstrous size. Truly Plaice, the heroine and narrator of this story, is born large and keeps on growing bigger, in a small town where she's often mocked due to her appearance, whereas her older sister, Serena Jane, is a normal-sized, eye-catching beauty. 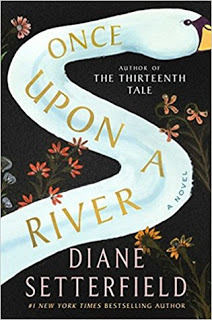 When Serena Jane suddenly disappears, leaving behind a husband and young son, Truly's life changes and she grows in new and unexpected ways. This grand novel is about inner and outer beauty, finding your place in the world, love and friendship, medicine and magic, life and death. I was captivated by this original book from start to finish, and look forward to reading more by this author.